WILMINGTON, Mass. 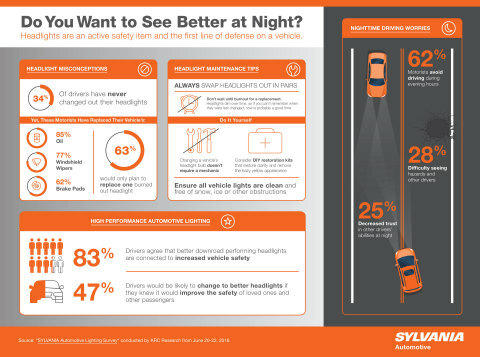 & HILLSBORO, N.H.--(BUSINESS WIRE)--A new survey released today from SYLVANIA Automotive Lighting, the leader in automotive lighting solutions for the automotive aftermarket and original equipment manufacturers (OEMs), found that more than two thirds (70 percent) of drivers are increasingly concerned about driving at night in the U.S. When it comes to headlight maintenance, the survey found that more than one third (34 percent) of drivers have never changed out their headlights. As a comparison, these motorists have replaced their vehicle’s oil (95 percent) and windshield wipers (87 percent), proving that headlights are an overlooked component during vehicle maintenance. Making matters worse, 63 percent of respondents admitted they would only plan to replace one burned out headlight instead of both at the same time, a common mistake among drivers on the road today. The majority (83 percent) of drivers agree that better down road performing headlights are definitely connected to increased vehicle safety, and 63 percent admit changing out their headlights is a very important precautionary measure. Additionally, just under half (47 percent) of drivers would be likely to change to better headlights if they knew it would improve the safety of loved ones and other passengers, yet noticeably more would do the same for their brakes (61 percent) or tires (55 percent). For premium safety during nighttime driving, the SYLVANIA SilverStar® family of automotive lighting includes a variety of high performance headlights to suit individual needs and driving styles. SYLVANIA SilverStar ULTRA is the farthest downroad headlight in the company’s product suite. It is also designed with a whiter light which improves contrast of items on or near the road. Together, these features enable motorists to see farther down the road, with increased side road and peripheral visibility. For more information on the SYLVANIA Automotive Lighting survey, or for further details on SYLVANIA SilverStar® headlights, please visit www.sylvania-automotive.com. KRC Research conducted this research via an online survey of 1,017 Americans (reporting on 936 licensed drivers) from June 20-22, 2016. For complete survey methodologies, including weighting variables, please contact Jessica Branco at SYLVANIAautomotive@matternow.com.